This is the Italian paperback edition of Talking God, the ninth book in Tony Hillerman's Navajo Mystery Series. This edition was published in 1991 by Arnoldo Mondadori Editore in Milan, Italy. The text was translated from English into Italian by Stafano Negrini. 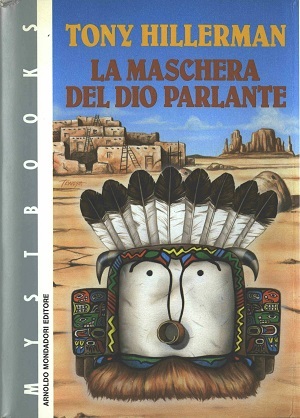 This paperback edition has a dust jacket designed by Franco Tempesta which features a mask of Talking God with Northwest Coast design elements on either side and a Pueblo village next to sandstone formations in the background. This edition also has a front and back cover fold-out. The front fold-out contains a brief synopsis of the story and the back cover fold-out contains a picture and short biography of Tony Hillerman. Format: Paperback, 22.5 x 15.3 cm. Binding: Grey paper covers with the publisher's logo, author and title printed in white print vertically on the spine.